Rodda’s Rowan of Rin series is a gentle and exciting introduction to traditional fantasy for 7+. Rodda has deliberately kept the fictional world of the story small. The names are uncomplicated variations of common names. No Cthulhu or Azaghâl here, which is truly a blessing for parents reading aloud to their children. There are only a few fantasy type creatures, all of which are easy to imagine and not intended to be terrifying. The small village of Rin is mercifully bereft of Dementors. And the story itself is a simple, established adventure story – reluctant child hero climbs a mountain, defeats the dragon (by gently removing a bone stuck in its tooth) and saves the day. I first stumbled across Rowan when I was 11 and I have loved him ever since. A quiet, shy, ‘skinny rabbit’ of a boy, he’s one of my favourite fictional characters of all time and was the first person to show me you can’t be brave if you’re not scared first. The Rowan of Rin series consists of five books, each with a different story but subtly connected. They are perfect for any child who is eager to read Harry Potter but isn’t quite ready yet. 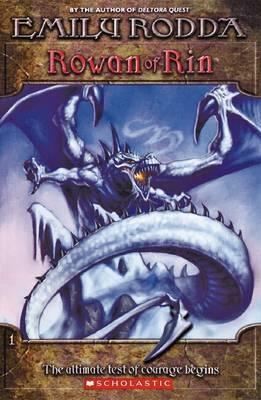 The Deltora Quest series is a more traditional quest story. It contains everything from magic gems to kings in disguise, and is an exciting introduction to your child’s first ever evil overlord! The Deltora Quest series is broken up into three stories – in the first one young Lief has been sent to restore the Belt of Deltora and, consequently, peace to the kingdom. Developing the story through several small books, each new series takes the reader deeper into the world Rodda has created. She gradually introduces the reader to new aspects of the genre with each little piece. These books are written at a much faster pace than the earlier ones and feature more involved stories. Rye, our hero, is a nice balance between the thoughtful Rowan and the headstrong Lief of Deltora. If you’re the kind of person who prefers matter transporters to magical portals, you might want to try your children on some of Emily Rodda’s junior science-fiction books. While they don’t contain aliens and warp speed spaceships they are fantastic lead-ins to dimension jumping and parallel/parasite universes. The best one to start with, for ages 7+, is Pigs Might Fly. It starts with Rachel, a young girl bored and sick in bed who just wants something interesting to happen. She wakes up on the back of a flying pig, in a mad world plagued by UEF (Unusual Event Factor) storms which cause all sort of unlikely things to happen, such as the Government passing laws to make all people over 10 wear a bag of fish and chips on their head at all times, or little girls from other more boring dimensions to appear out of nowhere. Rachel has to find her way back home before for the last UEF storm of the season. This was my first ever ‘favourite book’. It’s a great introduction to dimension travel and surrealism. Not to mention plain, silly fun. It’s also worth checking out The Best-Kept Secret, Finders Keepers and The Timekeeper.